I love a well-facilitated meeting. Helping people uncover their own wisdom or working with a group to help them meet their own goals – that is the sweetest! During my executive director years I experienced a lot of facilitation. The wide range of amazing and abysmal experiences are among the reasons why I became a facilitator. Maybe someday I will talk about the best facilitation experiences that I experienced but today I want to talk about the worst! I was a participant in an absolutely terrible process that had good intentions but no real clue as to how to achieve their objectives. I’ll call the convening agency XYZ in order to protect them. I could actually write pages on what XYZ did wrong, but I am focusing on one specific facilitation tip: The right tool for the job. Part of the art of facilitation is having the right process to achieve the desired goal. Team building tools and facilitation tools are a dime a dozen and tools are used to achieve specific goals like greater sense of community or deeper understanding of a text or greater understanding of community needs. A good facilitator chooses the activity that will guide the group to achieve the goal. On that Worst Day Ever oh so long ago, I was invited (told) to come to a meeting 45 minutes away from my office. We were going to have a Community Meeting and bring the Community together to…what? I honestly didn’t know what the purpose was but it was couched under the guise of “This Is Important To Do” with a hint that funding could be at risk if I didn’t go. So I went. I arrived to find a group of people I didn’t know, most of whom hadn’t been part of this so-called community initiative and who were also completely unclear as to why this day was happening. Like any good meeting set up, there was things on the table to play with and an agenda for the day though it had goals that I honestly did not understand. And then we did the Marshmallow Challenge. In my perspective, I played with spaghetti to become a team with people I had never met and with whom I would have no ongoing relationship. I have the picture to prove it. My frustration and rage went through the roof. I was an incredibly busy director of a small agency hustling for every dime and being forced into this unnecessary and fruitless meeting was a complete waste of time. It was the proverbial straw for me with XYZ and my willingness to participate. From that day on, “playing with spaghetti” became my descriptor for bad facilitation. For years! “Don’t ever make me play with spaghetti!” I would say. But then, many years later – nearly 10! – I learned about the Marshmallow Challenge in a completely different way. Through another course that I am doing, I learned about Tom Wujec and how he uses the Marshmallow Challenge. According to Wikipedia, Tom Wujec is the author and editor of several books, a fellow at Autodesk, an adjunct professor at Singularity University, a multiple TED Conference speaker and a pioneer in the emerging practice of business visualization. Here he describes how he uses the Marshmallow Challenge and what he learns from it. Totally different from my experience. He uses this simple teambuilding process to understand how teams form and what skills are needed for successful teams. He talks about motivation, incentive and risk. And how kindergartners perform best on the test. Much better than business students! He deduces all kinds of things and this activity is the absolutely right tool for the questions he is seeking to answer. Totally different experience from mine. 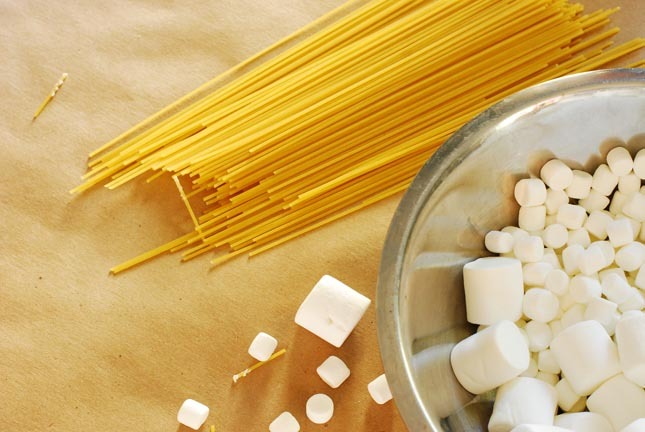 In my experience, the Marshmallow Challenge was completely the wrong tool for the job and caused scorn and bitterness and was a waste of time. In the right context, however, it is a brilliant learning tool. Excellent facilitation depends on knowing what goal you want to achieve and what tool is appropriate to help the group achieve that goal. Having a broad and diverse set of tools and knowing when to use them to achieve what outcome is key to successful facilitation. In the words of a classic evaluation question, I used to think that playing with spaghetti was the worst team building activity. Now I know that playing with spaghetti can be powerful when it is the right tool for the job.